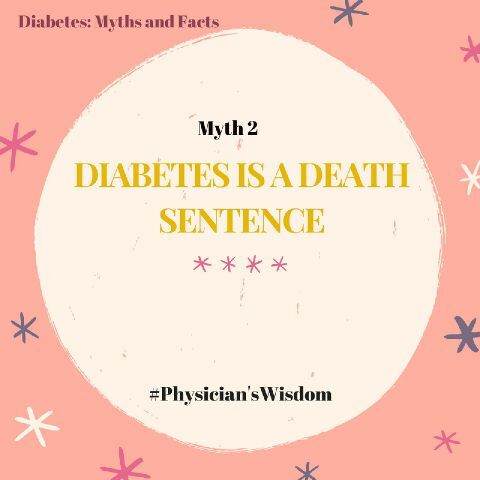 We recently started the discussion about Myths and Facts on Diabetes. If you missed the last post, kindly click here. Diabetes is not a death sentence. We established the last time that diabetes is a serious condition and is presently not curable. However, a diabetes diagnosis does not mean that you have been given an “expiry date”. It simply means you have to pay more attention to your health than before. There are several people who have lived with the disease for many years, some several decades and still living normal healthy lives without complications. 2. Get informed – Get information from authentic sources (Your doctors, support groups, books). This will help you understand better about the disease and how it should be managed. 3. Drug Compliance: Take your medications religiously. Let your doctors prescribe drugs for you. 4. Know yourself – You need to know yourself to be able to recognize signs of when your sugar is going too low (hypoglycemia) or too high (hyperglycemia) and you need to know what to do at those times. 5. Diet Control: Contrary to the old teaching that diabetics have to eat only unripe fruits and vegetables. Studies have shown that diabetics can actually eat most of the food every other person eats, only that they need to eat them in right proportions. It is advisable to eat more of food that are high in fibre and low in calorie. Your doctor should educate you more about this. 6. Regular exercise: This also helps to control your blood sugar better, reduce weight, slows down ageing and improves heart function. However, rigorous exercise is not advised. Exercises recommended include brisk walking, swimming, cycling, Dancing, Playing court games, etc. 9. Avoid cigarette and alcohol consumption. These can worsen the disease. 11. Participate in support groups. People living with diabetes will benefit a lot from family support. In conclusion, Diabetes is a serious health condition which may have devastating consequences if not properly managed. People living with the disease must be ready to take responsibility for their health and they can live normal healthy lives. Please feel free to drop your questions and comments. Dr Oluwadamilola Opawale is a medical practitioner with interest in Public health and preventive medicine. She has had a stint of experience from the famous St. Nicholas hospital as a clinician. She is also the President of IBuildAfrica Foundation, an NGO that reaches out to female adolescents, helping them maximize their potentials environment and background notwithstanding. She has a passion to teach people how to stay healthy by imbibing healthy lifestyle and choices.